Information is provided by Mayor Gary Haakenson of the City of Edmonds. While logger George Brackett paddled his canoe through Puget Sound in 1870, a windstorm forced him off the rough waters and onto the gently sloping beach at the future site of Edmonds. He immediately became interested in the heavily wooded hillsides. Two years later, he purchased 147 acres for $650 and began logging his claim. Other settlers trickled into the area. In 1884 Brackett platted the new town and applied for the establishment of a post office. He built a small wharf at the foot of what is now Bell Street. Houses for the townspeople were barely finished when it was decided to start a school in Brackett's feed barn. By 1887 fifteen youngsters (including Fred Fourtner who later became mayor of Edmonds with the longest tenure in office) attended class in a one-room schoolhouse constructed a half block north of George (Main) Street. 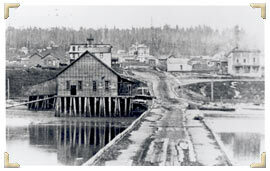 In 1889 Brackett built the first sawmill and loading dock, near what is now the ferry terminal, and established a pattern that would dominate the waterfront for the next 60 years. He named the town after Senator Edmunds of Vermont, but a mistake in the spelling changed the official designation to Edmonds. Many settlers felt it was time to incorporate the town by 1890. According to popular legend, minor fraud was necessary to get the required number of names on the petition. As the story goes, it was necessary to show a population of 300; however, an official census taker determined the population was only 298. A hasty meeting of local citizens was called and a committee appointed to "get two names." The committee returned a short time later and informed the census taker that he overlooked the names of Bill and Bollivar Brackett who were among the oldest residents of the town. Bill and Bollivar Brackett were officially registered, and the census taker departed. After the charter was granted, it came out that Bollivar was an old bull belonging to George Brackett. Bollivar had hauled logs for so many years that his master placed him on his pension list, and Bill was Brackett's faithful cattle dog whose only duty was to look after Bollivar and see that his special food wasn't stolen by the younger cattle. 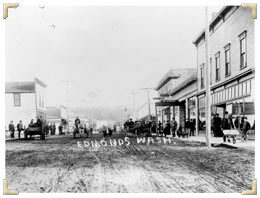 Edmonds was incorporated as a "village fourth class" on August 11, 1890, and George Brackett became its first mayor. Edmonds currently has nearly 40,000 residents and is the second largest city in Snohomish County The sawmills that were a major part of the scenery on the waterfront until the early 1950s are gone, replaced by the Port of Edmonds, the ferry terminal, and public parks. The lush hillsides are filled with homes, schools, churches, and businesses. Regardless of Edmonds' changing face, it still remains a waterfront community with a gently sloping beach and a magnificent view of Puget Sound and the Olympic Mountains.